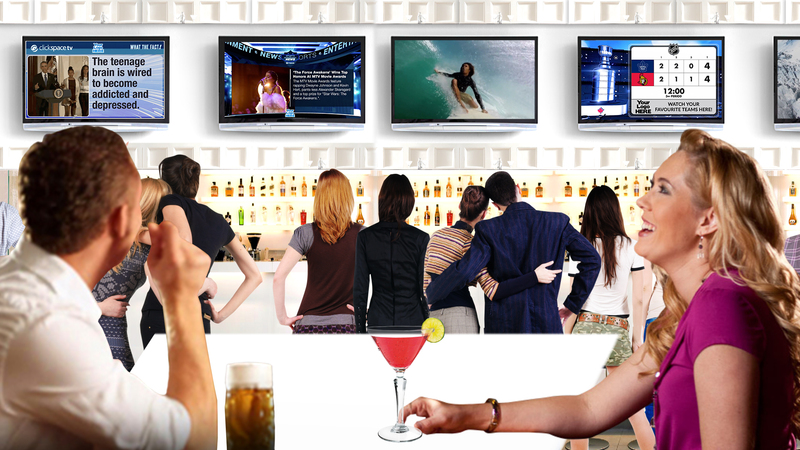 Communicating with your guests using your existing TVs is effortless and effective with your own in­house TV Channel. 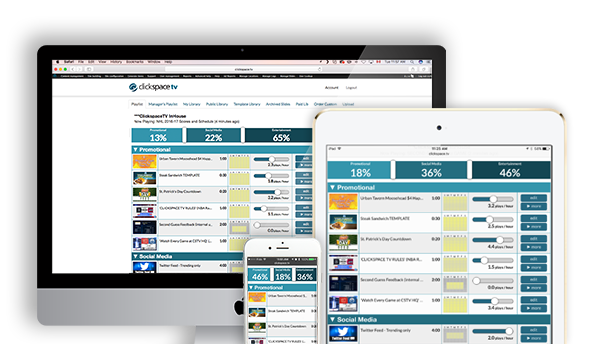 Clickspace TV creates loyalty, spurs return visits, and promotes your real­time specials and upcoming events. Choose a template from our ever­growing library and get a fully animated ad immediately, with no new software to learn. And if you can’t find what you need, send us your promotions and let us create something spectacular, just for you. 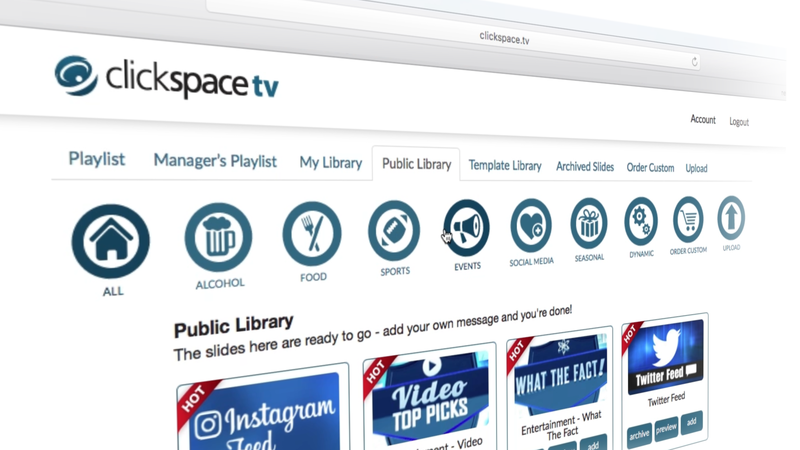 Clickspace TV gives you access to and extensive library of animated promotions, live social media feeds and entertaining content that allows you to create your own customize TV Channel. The service includes our powerful HD media player and our proprietary web-based administration software. 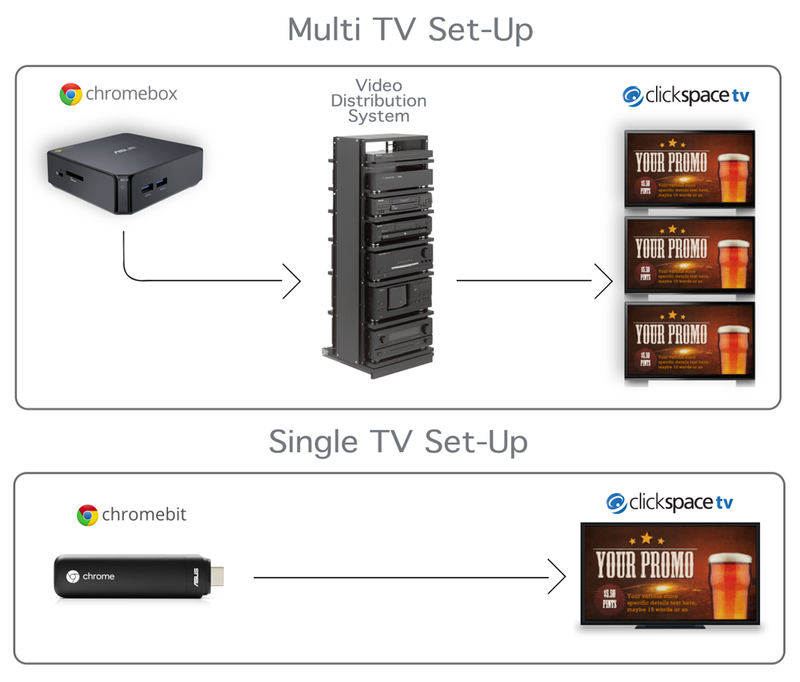 Clients simply plug the CSTV Media Player into their video distribution system or directly into their TV and then configure the Media Player to connect to their wifi network. Once the media player is online, location owners can combine content to create a mix of entertaining programming blended with their promotional messages. Draw eyes to your screens and enhance your atmosphere with your pick of licensed or original content, curated by Clickspace TV. Add our Second Guess Trivia game, and watch your guests compete against each other in real­time from their phones, no app or download required. And use our social media feeds to encourage more social media likes, longer stays, more frequent visits, and increased loyalty without lifting a finger. Your guests can see themselves on the big screen and promote your brand at the same time using our live social media feeds. Photos, Videos, Comments, Tweets and Likes appear on the screen in moments, with stringent filtering to eliminate naughty or negative user content. Create your custom guest experience with Clickspace TV’s simple web interface, which lets you mix and schedule your content across any number of locations. 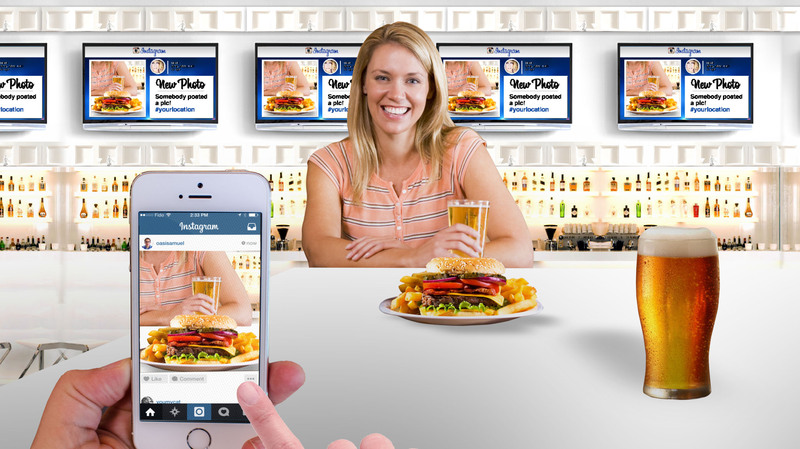 Then give limited access to your local staff, letting them create promotions in real­time: lunch specials, last calls, or wishing a happy birthday, done in an instant from their phones. "Marvin has put together some amazing stuff and is always quick and efficient with my requests. Literally, just amazed with what he has done with the slides I have asked for. The company on a whole has been excellent, and I just wanted to say thanks again guys!" "We were shocked by the number of Instagram posts recieved since we started using Clickspace TV. We are reaching thousands of people with photos of our pubs."